With explanations in hand, I set off on a walking tour around Brooklyn Heights on a stinking hot day. I meandered through the pretty streets taking note of the historic buildings and different architectural styles. The walk was beautiful, so was the recommendation of the Brooklyn Ice Cream Factory. Located on the water, with views and an appreciated cool breeze for a day “in the 90s”, one could mistake the weatherboard shop as a touristic gimmick. Don’t. This place has been voted the best by tourists and New Yorkers alike. Brooklyn Ice Cream Factory, prides itself on its ingredients and handiwork. There are only eight flavours: strawberry, peaches and cream, butter pecan, vanilla chocolate chunk, chocolate chocolate chunk, coffee and (the two classics that I chose) chocolate and vanilla. I ordered without waiting and sat myself at a table, smiling as I saw others enter forming a queue all the way out the door. It seemed I had arrived just in time. A few minutes later I had to move outside, inside was stifling but, outside, a cool breeze gave at least some relief in the shade of the trees along the pier. 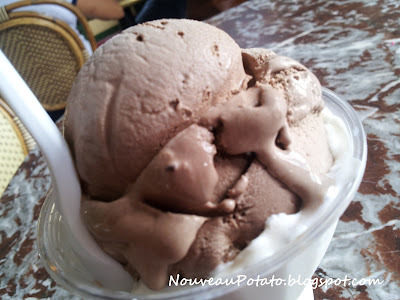 The chocolate ice-cream was lighter in colour but still rich. The vanilla was flavoursome, but I found it too sugary – causing me to search for water which I gulped down as fast as I could. Both were beautifully smooth and creamy. It is hard to say whether I preferred Brooklyn to the Riverside in Port Jervis. They have their similarities: a waterside view, respect for tradition and reputations as the best in their area. Being with my friends, sitting by the river and eating decadent sundaes in Port Jervis was hard to beat.